If you like challenges in your life..
Whoa that sounds difficult you could think, I agree it’s not the easiest thing to do in the world. Also doing this without a lift is more tricky, since you have to lower the whole assembly instead of just lifting the car up. When would you need to do this job? This is quite a rear job, but changing differential or trailing arms this might be necessary. Also with restoration, body work or mayor overhaul of the car suspension such as replacing those difficult rubber bushings. Set aside time, this is time consuming. Don’t expect to do this on a Friday and be driving again Monday morning unless you are super man. I will rank this maybe even more time consuming than taking out the engine. Get all the necessary replacement rubber parts, such as sub frame rubber mounts, differential hanger, trailing arms rubber bushings. Rubber seats for the rear springs. New rear springs if needed? Have at least 3 jacks available. And put your car high up on four big jack stands before starting. 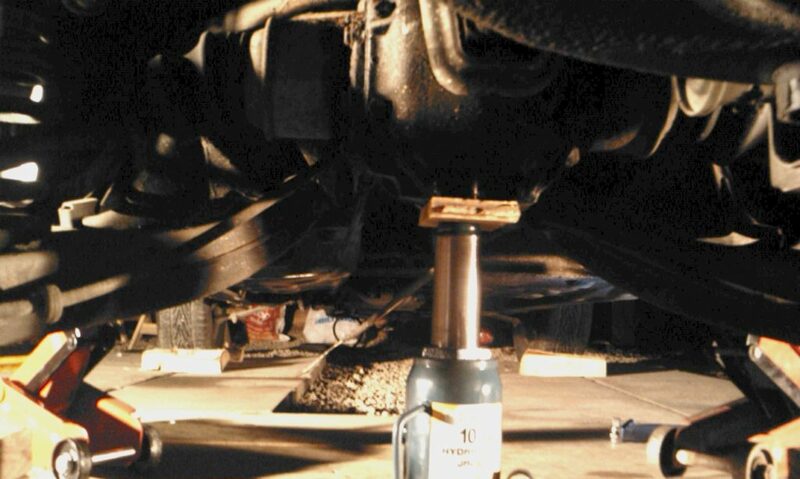 The jack stands need to placed in the frame of the car so you can lower the sub frame freely. No special tools needed other than your large spanners, big sockets and long breaker bars. You will encounter 120Nm bolts here. Take off the rear brake Calipers and the sway bar links. 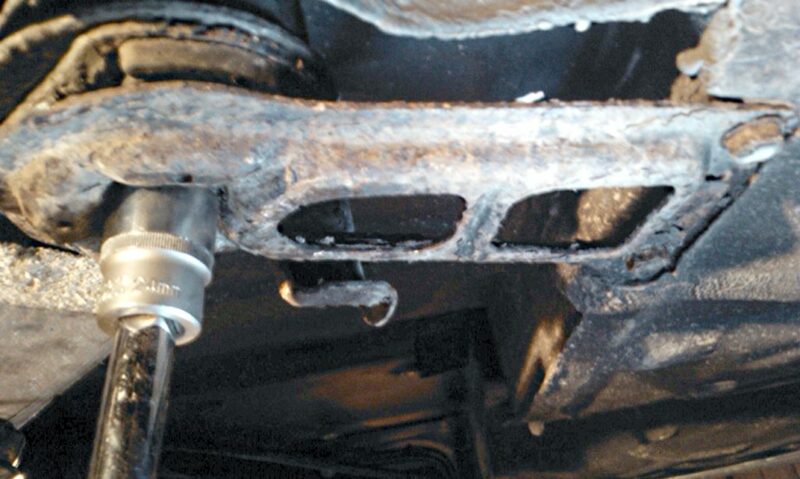 Support the differential with a jack and make sure it can’t slide off. Support also the large sub frame arms with jacks. Jack supporting the differential, note the other two jacks up front supporting the sub frame. Then you have to loosen the two big sub frame tightening bolts. 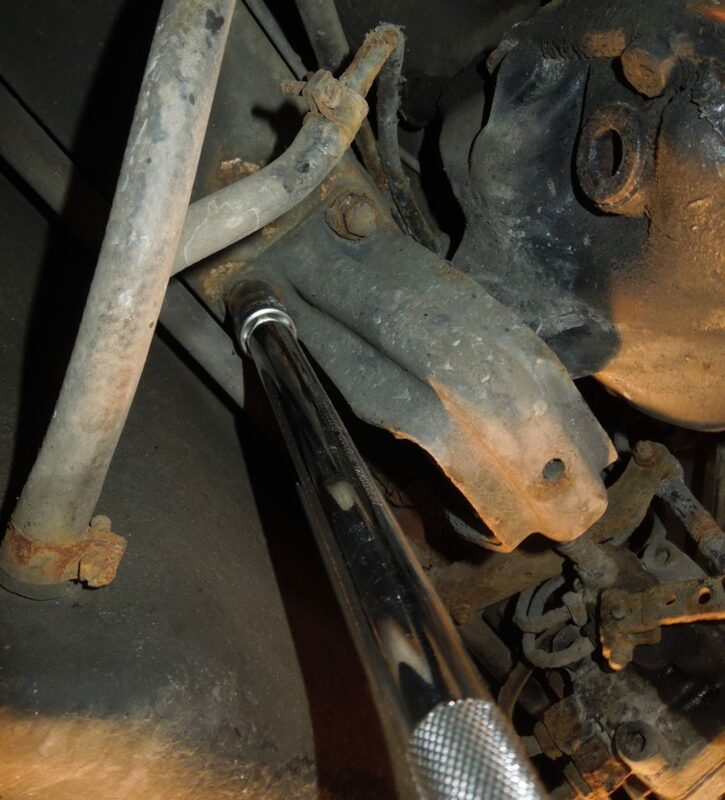 Use a very long breaker bar and lots of force to loosen these bolts. Then you can take off the sub frame mounting plates by loosening the two bolts to the body. Next step is to loosen the differential hanger to the differential. If you are replacing this part (you should) then loosen the top four bolts, if not then loosen the two big bolts attached to the differential itself. Now the sub frame is free from the body. 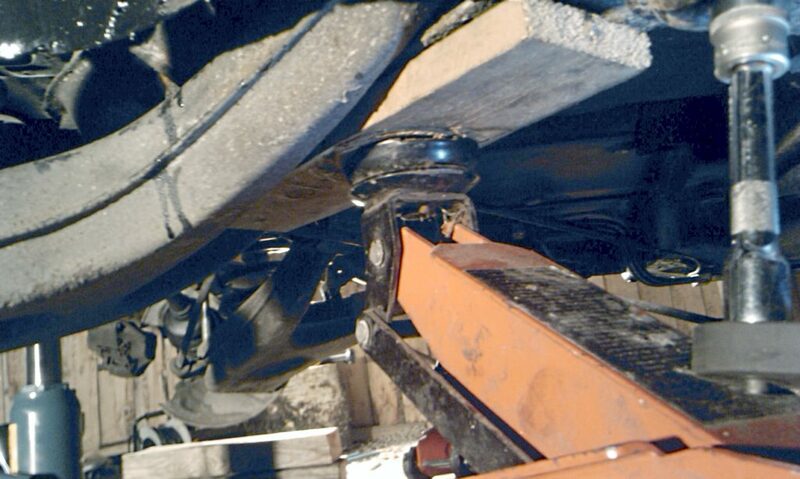 Start lowering the whole ting very slowly to release tension on the rear coil springs. Preferably there should be three persons lowering each jack at the same rate, if you are alone you must lower each corner a little bit of a time until the while thing sits on the ground. Use some block of wood to support the assembly while you withdraw the jacks. Then drag the whole assembly out from the car. Congratulations! Reverse of removal, however don’t forget to place the springs before raising the sub frame. The most difficult part was to align the whole sub frame so the bolts would fit exactly, this is more than a little fiddly.